We specialize in promoting professional real estate services by providing title insurance policies and related real estate transaction to domestic and international individual consumers and businesses making sure to provide peace of mind to our clients when executing a purchase and/or sale of real estate properties in Florida. Our products and services, by virtue of our leading title insurers which we represent, protect our clients from financial loss and hardship related to unknown judgments and liens, inconsistencies within a property’s title, forged transfers or misapplication of fiduciary funds. 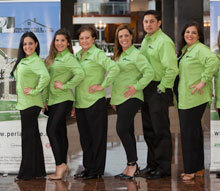 Our team of professionals and specialists are prepared to assist and guide you, while providing personalized service in Spanish and/or English, step by step in the property acquisition process. We strive to provide outstanding title insurance solutions and related real estate services, so as to meet the needs of people who seek to invest, develop or live in South Florida. In addition, we possess a strong real estate professional network and representative marketing offices in the US and Latin America, which work with us in the effort of promoting our title & escrow services and solutions. Our goal is to provide high quality services with competitive fees out of our different convenient locations in Miami situated in the areas of Brickell, Dadeland, Doral and Weston to proudly and gladly serve our clients in Miami-Dade and Broward County. Perland Title & Escrow Services Corp. was founded in 2007 in the city of Miami, Florida and has provided the best in people to ensure that real estate transactions close in a friendly, efficient, and professional manner. To establish a trustworthy and competitive environment based on our core values, where our team will consistently and proudly deliver superior service focused to excel our valuable customers’ needs and expectations to reach fully customer’s satisfaction, and to set our company’s brand apart from the competition in the Real Estate industry. To be the leading Title firm in both South Florida and the region, by offering all of the services that make up the real estate business with real and effective solutions within a global framework.